Vee at A Haven for Vee is having her April Note Card Party. I enjoy her note card parties, but have never joined the party. But, this month I've decided to give it a try. The idea is to go through your blog and find four pictures you like that you think would make pretty note cards. My first thought was to go through my blog, looking for pictures of flowers. But, since I have been posting so many flower pictures recently (after all, spring is here!) I decided to look for pictures on another theme. 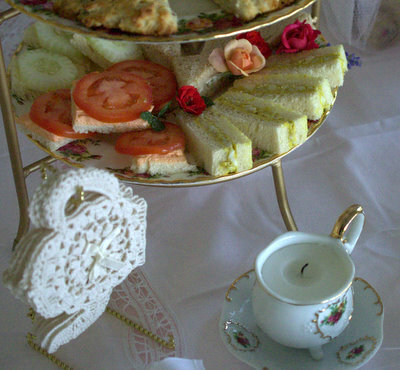 I settled on pictures of an afternoon tea party I had for my friend, Karleen. It was prepared for her birthday a few years ago. But, my love for flowers can't help but spill out! 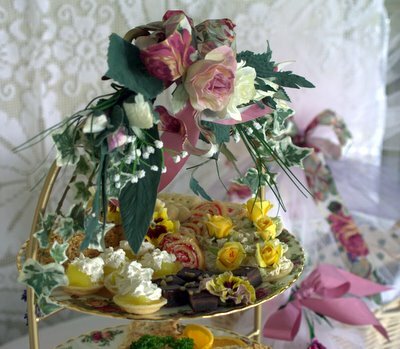 The food and the 3-tiered tray are decorated with fresh, miniature roses from my garden. Flowers win! It was a sunny, spring day. 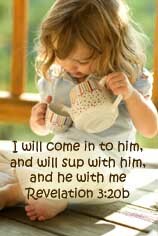 We shared the tea foods with our sons who were busy playing computer games in another room. They didn't mind the froufrou as long as the food was good! Silly guys! 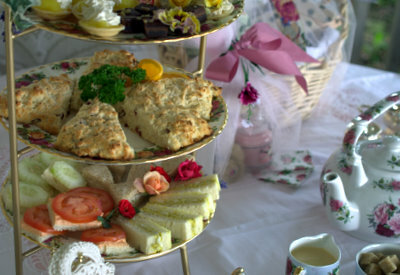 Karleen and I sat out on the covered porch and enjoyed tea sandwiches, scones with clotted cream, and dainty sweet treats. 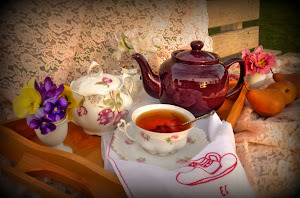 Hot tea with brown sugar cubes and milk were enjoyed by the dainty teacups full! Thank you, Vee, for the opportunity to browse through the Gracious Hospitality archives in search of pretty pictures and happy memories. You can visit A Haven for Vee by clicking on this link. I'm also joining Heather for her Tea Trolley. Your choices for note cards are perfect! Each one is so very lovely! I love doing tea...and have many times...I love all your pics...but I wondered about the tea shaped coasters....did you make those? I LOVE them! I remember seeing some of these...it must be the plates of delicious savories and sweets and those charming crocheted coasters. I've enjoyed tea before, but not like this...hmmmm... Thanks for joining us! 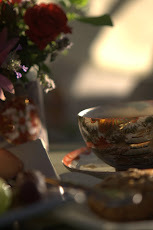 Beautiful photos of Afternoon Tea Trays! These would make lovely notecards! Your cards make me want to come to have tea with you. The settings are so inviting. Lovely! Gracious Hospitality indeed!! These are pretty shots! The tea party made for some nice cards. 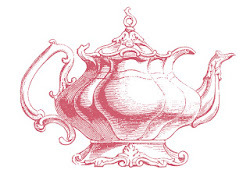 I like the teapot. Ooh can I come to your next tea party - please?!!!! Even if you said yes - I'm way too far away but I could be there in spirit! 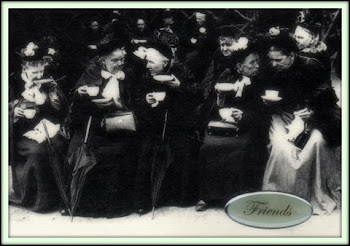 These make such a pretty set of Note Cards for my firends - we all lOVe afternoon tea parties!! Really nice set of cards on a great theme! 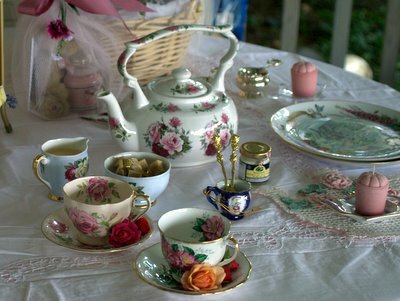 There's nothing I like better than tea (and a party) ... add roses and it just has to be perfect! Wonderful selections for Vee's party. 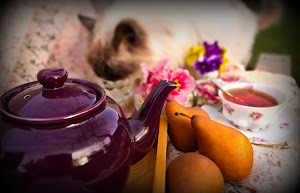 What a lovely tea party! Wonderful choices. Gracious and lovely photos for an awesome assortment of note cards. Your notecards are making my mouth water! 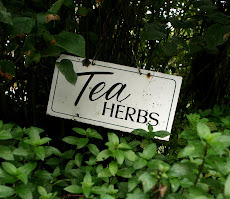 I do think I'm long overdue for a nice tea outing! Excellent choices. 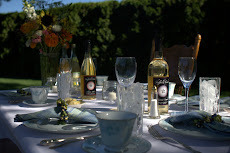 I love a good tea party, and this one looks GOOD! 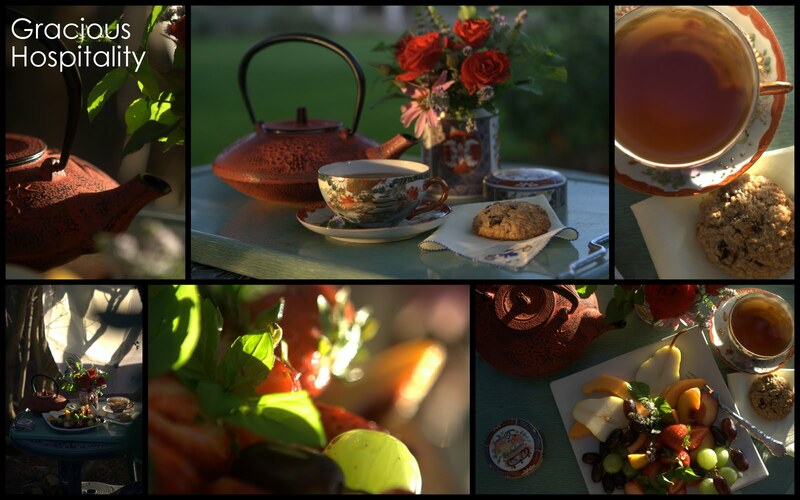 Such beautiful photos of an exquisite tea party. I know your guest felt very pampered. Your table setting is gorgeous and the food looks really yummy too. I can't wait until it warms up more here and we can do some our door dining too! Beautiful! And flowers do win anywhere and anytime. The tea party note cards are so lovely! I'm sure everyone enjoyed the yummy food.